Lol. You cannot erase the legacy of Sailor Moon. It's been 27 years. Me thinks the problem is that SM keeps with the same dated story. I find it insane that shows like DBZ and everything else can get new does to face but we can't get that with SM. No new adventures or challenges to build hype off of either. Be cool if we had a new antagonist. I'm also wondering about the length of this movie and just what they have to animate. All the Senshi appear in this movie. We have characters undergoing several forms, new attacks and very "colorful" villains. Double Moon Gorgeous Meditation...etc. They have a lot to consider when plotting out this movie. Just things they need to be really careful about this one and how it paces for sure. And that has more to do w/ Toei's will than its capability. They did what? Where can I find what they did? Yeah, they should have updated or put in new adventures, made a sequel to the original anime or manga if they wanted to do Crystal! 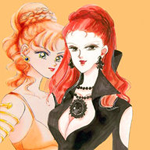 The conceit for Crystal was to do a faithful adaptation of the manga as a celebration of the franchise's 20th (then 25th) anniversary. At the same time, the musicals were revived and did the same thing. Celebrating the series' milestone anniversary by closely adapting the source material makes sense, given that the original anime and run of musicals didn't do so, but having two simultaneous close adaptations I think made the franchise feel stagnant, and the overall high quality of the musicals also just served to further highlight how weak Crystal was. The general incompetence of Crystal - its bad writing, its bad animation, its inconsistent presentation, its lengthy delays - has also served to further make the franchise feel stagnant. The recent Nogizaka46 musical was a good opportunity to do an original story, but at the same time I understand why they did the Dark Kingdom arc again, and they honestly did such an amazing job, I really can't be mad. The Super Live was perhaps a better chance to do an original story, but they decided to play it safe and easy and do the DK yet again. The new musical that we're supposed to get later this year is another chance for them to do a new story, or even just to do a new adaptation of an existing non-manga story like the Doom Tree arc, the Last Dracul arc, or Another Story. If they do the Dark Kingdom arc once again, I feel like that would be the last nail in the coffin for originality in this franchise for the foreseeable future. Which I find crazy considering how the old musicals had a ton alternate stories & characters. I’m surprised someone remembers! You can find it here: When yo do you think were getting the movie ? I fully expect it to be more like a compilation film at this point with a ton of scene cut. The fact they struggled with the script doesn’t give me hope. Lol. You cannot erase the legacy of Sailor Moon. It's been 27 years. Me thinks the problem is that SM keeps with the same dated story. I find it insane that shows like DBZ and everything else can get new does to face but we can't get that with SM. No new adventures or challenges to build hype off of either. I don't think it's entirely TOEI's fault, though. I think Naoko controls the franchise as she pleases. If she were like the creator of Saint Seiya (he allowed other writers and mangakas to expand his story), then we'd have new arcs and even spin-offs. Naoko's wasn't upset so much as disappointed, but she got her wish with the S movie and remarked that she regretted being such a pain. For the SuperS movie she just contributed character designs and maybe some basic plot ideas. When the musicals started up again she gave the producers her blessings to do whatever they wanted. Her involvement has been minimal, probably just casting approval. She didn't have any problems with the old musicals using original stories. The recycling of her storylines isn't due to her imo; it's due to the general laziness of Toei and Nelke. So TOEI is lazy with Sailor Moon, but not lazy with Dragon Ball and Saint Seiya? They simply chose to develop Pretty Cure instead. It is way more milkable, they own it and can do whatever with it. Why would they expand Sailor Moon beyond the source material, riviling their own property? There is not much thry can do with Sailor Moon sequel that they cannot do with Pretty Cure. I am sure Naoko is not the problem as well. Keep in mind that Sailor Moon struggled with raitings for SuperS and Stars and they probably don't trust the franchise as much ever since. Naoko is really getting demonized more and more in recent years with no proof of her involvment. As for people blaming her for not cotinuing the manga. She as a creator decided 20 years ago that the story needs to end. I really don't blame her for that. Even Stars was a drag. The industry moved on. Magical girl genre has seen a lot of changes. From businesses point of view a continuation is probably not marketable for this particular property. After the anime (which didn't really follow the manga), we got the live action series which also deviated from the manga in some fairly wild ways, and we all know Naoko loved that show and was heavily involved in it. Clearly Naoko is fine with new content. It's possible she wanted Crystal to be a faithful adaptation of the manga, but that doesn't mean she's opposed to original stories as a rule. Like sapphire said, Toei is probably focusing its creative energies on PreCure, which they own entirely, rather than on Sailor Moon, which is 27 years old and owned by another party with whom they'd have to share approval and royalties. I think it's also probably the case that Toei simply doesn't do market research; they're unwilling to listen to fans and learn from their mistakes and probably think we just want to relive the same five story arcs over and over. I think they also don't want to take any risks because they can't afford any (more) major flops. The original anime had something of an open ending, so a sixth season might have been a viable concept at one point, but I think that ship has sailed. The manga has a more definite ending, so if they did a sixth season for Crystal, it would have to be either a Crystal Tokyo sequel or a Silver Millennium prequel (which would probably just end up feeling like another Dark Kingdom arc permutation). 1) It seems up in the air whether or not Crystal will even turn out the promised Dream arc movies; it's never getting a sixth season / post-Stars movies. 2) They might not think a Crystal Tokyo movie or season would be successful, though I doubt they've given it any thought. (There are so many obvious things they should have done in Crystal so far that it's apparent to me the people working at Toei have zero personal familiarity with or investment in the series, so they're definitely not spending their free time dreaming up fan fiction.) Similarly, they might not think a Chibi Moon spin-off would be well-received, or any number of other possibilities. 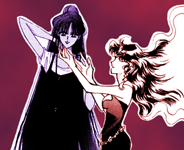 They've probably forgotten all about Codename: Sailor V's existence. At the end of the day, I don't think a sixth season is in the cards, for Crystal or any other adaptation. The best bet for new stories are with movies (which will have to wait for the next reboot once Crystal ends/gets canceled) and the musicals. And it's not because of Naoko being a stick in the mud. It's because Toei is lazy, conservative, and disinterested. Yes, but part of me cannot blame Toei entierly. From their perspective SuperS and Stars were underperforming back in the day. The live action wasn't well recdived initially. At the same time the manga has always selling well. I can understand why they choose to try it this way. While ChibiUsa was very popular in manga serveys in Japan, she was not as like in the og anime, plus the season focused on her was the one that started the decline in ratings. I can understand why they decided to not explore a sequel based on her. Plus 5 pre-teen girls team souds too Pretty Cure like and whatever thdy could coe up with it, they can do with their own show. While a Silver Millenium sounds like a cool concept, part of the appeal of this portion of the story is how little we know about it. SuperS and Sailor Stars flopped not because people no longer cared about Sailor Moon, but because those seasons were excessively formulaic and did away with the popular Outers for the most part. But Toei doesn't understand that because they're stupid. I don't know if I'm in the minority on this or not, but my ideal state for the franchise (at least right now) would be for it to become a DTV/OVA series (kind of like Scooby-Doo, but hopefully better quality). Rather than rehashing the same ideas or trying to do an entire season, they should just release one or two standalone, 90 minute movies. With that format, they could explore so many different story ideas without taking a huge financial risk, and the franchise would really feel revitalized. The problem is that the OVA format is dead... Most tv anime in Japan sells under 1000 units. Who would buy dtraight to video films. Regardig the quality would be absurd. Plus there is no market for OVAs anymore. That's true for Japan, but I think a DTV series would probably do fine in the US and other countries. It's just a matter of Toei being willing to let other studios handle such a project for an international market. Japan as every other country is mainly their market first. So theywould never mske anything precisely for other countries in mind. Regarding PGSM, the show did create a new generation of fans for the franchise back then, who're toddlers or kindergarteners at the time - they may not be huge in numbers but are certainly there.